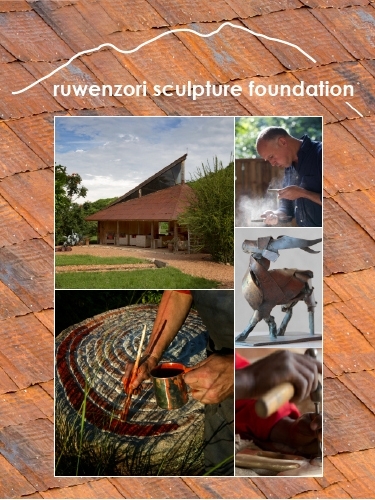 The Ruwenzori Sculpture Foundation is a registered charity set up in 2004 by the directors of Pangolin Editions and Parabola Land Ltd. with the aim of enabling cultural and educational exchanges between artists in Africa and the UK. It funds residencies and workshops and provides the infrastructure, facilities, materials and training needed to meet its objectives. In its early days, the Foundation received crucial support from the British Council, Tate, the Royal Academy of Arts and the Royal College of Art. Many individual artists and supporters have also generously donated and have been critical in allowing the Foundation to pursue its aims. Since 2008 it has built an Art Centre, with bronze foundry, gallery and studios, on 60 acres of land in Kyemihoko village, ten kilometres north of Kasese in Western Uganda. The Foundation’s land encompasses a short stretch of the River Sebwe and climbs 300 feet into the foothills of the Rwenzori Mountains.